Home brewing education, resources, reviews, recipes, and more. Learn to craft great beer with us. Beers were drank and grammar suffered. HopHead Hardware is part of multiple affiliation programs and links help HopHead Hardware generate revenue. We appreciate you using our links if you decide to purchase anything mentioned on this website. brewers. They are great for adding more complexity and color to a beer but crystal malts easily can ruin a beer too. Crystal malts are often called caramel malt because of the caramel-like sweetness that they add to a beer. A brewer can make a simple all 2-row pale that is tasty enough but with the addition a small percentage of crystal malt into the grist that pale ale may make the jump for being a decent beer to being a good or even great beer. There are many different types of crystal malt. They a separated by their level of color depth measured in degrees on the Lovibond scale (° L). Crystal malts range from 10° L to 200° L. These malts have a very specialized malting process. For comparison, pale malts range from 1.5-3° L while roasted barley is 300° L. Crystal malts start out as barley. The grain is steeped and germinated. After that, they go through a process very similar to mashing but the husks are not cracked open. This "mashing" converts the starches into sugars. From there the grain is dried in a kiln. This kilning process darkens the outside and caramelizes some of the sugars on the inside. The darker colored crystal malts go through a more intense kilning. Brewers do not need to learn and special mashing techniques to use crystal malts. Extract brewers can use them as a steeping grain when partial-mash/mini-mash batch. For all-grain brewers, they are just part of the grain bill. It is worth noting that the grains shrink a little bit when they are transformed into crystal malts so it is important to keep an eye on the crush. A mill gap that cracks open crystal malt might pulverize base malt. The amount of crystal malt used is very important. Too much can result in an overly sweet beer. A simple pale ale can have as little as 5% crystal malt of the grain bill with a noticeable sweetness while an ESB can have around 20%. ESB is one of the sweetest styles. It is not recommended to use more than 20% crystal malts in a grain bill. Come join us on our Discord. There are plenty of people there to discuss crystal malts, and other specialty malts, with. We can even help you develop or review a recipe. We recently teamed up with Brewer Dude to offer Monster Chaser IPA kits. The kit is available in all-grain and extract versions. 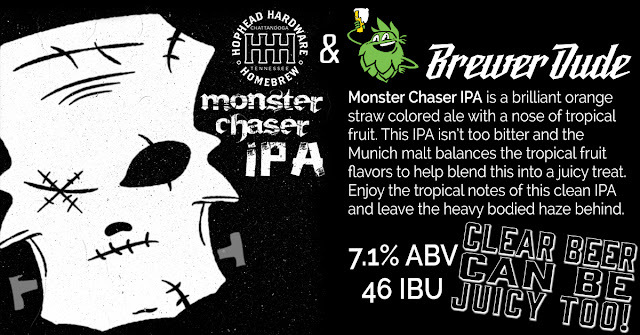 Monster Chaser IPA is a brilliant orange straw colored ale with a nose of tropical fruit. This IPA isn’t too bitter and the Munich malt balances the tropical fruit flavors to help blend this into a juicy treat. Enjoy the tropical notes of this clean IPA and leave the heavy bodied haze behind. Monster Chaser features Centennial, Amarillo, and Mosaic. When I designed the recipe I wanted it to be versatile. Modifying the hop schedule, adding additional specialty malts, adding hops, and using various yeast strains can change Monster Chaser IPA. It is a really tasty treat when it's brewed to specs but most of us homebrewers like to leave our own mark on the beers we brew. Monster Chaser IPA was formulated to be a 5.5-gallon batch to account for trub loss. Ferment Monster Chaser with a clean yeast such as WLP001 or US-05 to brew it the way it was intended. If you would like to up the juice you could add more Mosaic and Amarillo and a whirlpool ar hop stand addition and ferment it with 1318 London Ale III. An addition of flaked oats, along with the London Ale III, would help haze it up and soften the beer pushing it towards NEIPA or "Hazy or Juicy Ale" as the Brewer's Association would like for us to call it. If you get one of these kits share your experience with it using #MonsterChaserIPA on your favorite social media platforms. You can share your photos and experience of your finished Monster Chaser IPA on Untappd HERE. NOTE: The numbers listed on the graphic are estimates. 75% efficiency and a healthy fermentation assumed. The project is called American Mild Month because we want to encourage brewers and drinkers in the US to brew and drink mild ale, but it could also be read as a project to create a new beer style, the 'American Mild'. It seems almost oxymoronic in this day of ever more extreme beers to advocate for a style as restrained as mild, but here goes anyway, what would an American Mild look like...? Let's start with color. The SRM numbers for English milds range from 6 to 34, which is basically the entire spectrum of beer. The majority of milds though fall in the dark category, starting at 17 SRM, which is a deep orange to amber color. An American mild then would be deep amber, with red in the mix as well, veering up to brown at the upper limit. Alcoholic restraint is a hallmark of the modern mild ale, and we believe that an American mild should follow that tradition, topping out at 4.5% abv. We imagine most American milds would fall between 3.5% and 4.5% abv. Clearly then the American Mild is not a hop bomb, but neither need it be a hop free zone. 'Low' is not the same as 'none', it is all about restraint, and with the wide variety of American hops available the range of hop flavors is actually quite broad, whether its the spiciness of Cluster, the grapefruit of Amarillo, or the tropical fruit of El Dorado, there is room here for differentiation, and dry hopping is ok too. Remember though, before going crazy with the hops, an American Mild is not a Session IPA, or a Session Cascadian Dark Ale, it's still a mild. Traditional English milds top out at 25 IBUs, but for an American Mild we would suggest an upper limit of 30 IBUs. One major departure from the English mild style in a theoretical American mild is the yeast. The classic American yeast strain used by many an American craft brewery is known for being very clean, allowing the other ingredients to shine through without contributing the fruity flavors of the British yeasts. So there we go, a restrained, darkish ale, with gentle hopping and a clean finish so that the malt and what hops are present, shine through. At the end of the day drinkability is the key feature of an American Mild. Head on over to http://www.mildmonth.com/ and lend them some support because when the fads are gone classic styles are what will have to fall back on. Visit them on Facebook to at facebook.com/AmericanMildMonth and on Twitter at twitter.com/MildMonthUS. BrewerDude is offering the 9.25-gallon RoboBrew for an introductory price of $479.99 with flat-rate shipping for a limited time. This thing is killing the GrainFather from what I am seeing all over the hombrew forums. All in one brewing systems with recirculating pumps are where it's at. They make brewing simple and easy and get homebrewers doing all-grain earlier, many starting with their very first batch. The Robobrew is going to lead the charge with its amazing price point. The new version 3 of the Robobrew on Presale! If you order now it will ship in late May.It now lets you set up to 6 different times and temperatures so you can do a fully automated step mash! Again, please note this is a pre-order opportunity to place your order now for delivery in May. 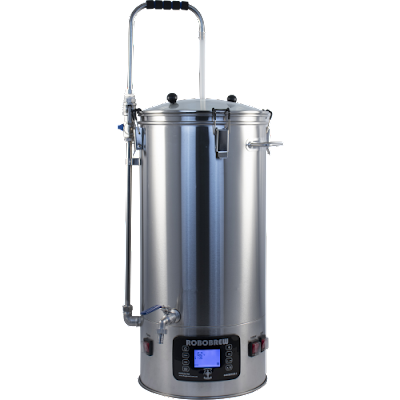 The Robobrew is an all-in-one electric brewing system that has built in elements for heating and boiling, a built in pump for recirculation, an onboard water resistant control panel for setting and monitoring temperatures, a removable grain basket, and a built in spigot for transfering. It is extremely portable and uses 110v power so it can be used nearly anywhere. Built in magnetic drive pump to easily recirculate the wort during the mash. We recommend getting some silicone tubing to go with the recirculation arm. This allows you more control over the recirculation and you can then use the pump to transfer your wort to your fermenter. Dual heating elements run off of a single 110 volt plug and have individual switches allowing for more control over the heating process. One element is 1000 watts and the other is 500 for a combined 1500 watts! Use both when you need to ramp up the temperature quickly either at the start to get to your mash temp or to go from your mash temp to boiling. Use only one of the elements when you want to hold a temperature. The digital control panel makes it easy to see the current temperature and set the temperature you want. You can also set a delayed start of up to 23 hours in advance so that you can have your water hot and ready to go when you get home from work or get up in the morning. The digital controller is also water resistant so don't worry about spills or some water dripping down the side. This controller is built for brewing! The brewery also includes a stainless steel malt pipe with false bottom allowing you to easily shift from mash tun to boil kettle during your brew day. The malt pipe includes a handle to lift it from the RoboBrew and tabs at the base so you can set the malt pipe over the RoboBrew to let the wort drain out. It also has feet at its base to raise the malt pipe slightly off the base and help prevent clogging. The included stainless wort chillers is shipped with bare ends so you can set it up for your situation. We list below the most common tubing and fittings sold to help connect to a hose, hose bib, or faucet. Note: The manual references an element for a different market. This unit comes with a two heating elements for a total of 1,500 watts. 2' of 1/2" ID Silicone tubing for sparging and draining. To connect includedchiller: 20' of 1/2" ID tubing, 3 small hose clamps and 1 brass Garden Hose Thread by 1/2" barb adaptor. You can get yours by clicking HERE. At the dawn of time, HopHead Hardware set out to create an active community of homebrewers. We like to bring like-minded people together all in the name of making better beer. We recently discovered Discord. a chat system that is not unlike Skype or Slack. Discord was originally built for gamers but was later opened up for other communities. It is, without a doubt, the best chat client available right now. (Coders head over to Slack. It was built for you.) We at Hophead Hardware created a Discord server a few weeks ago and it quickly became a success. Rumblings of a homebrew competition started catching some fire so the mods and I went to work. 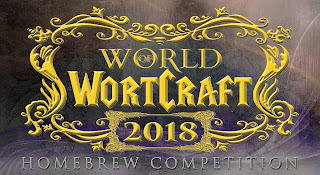 Today we announced the inaugural World of WortCraft Homebrew Competition. 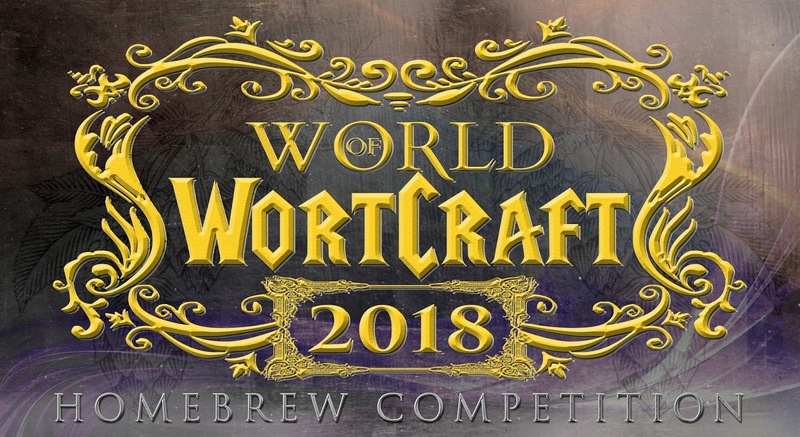 World of WortCraft 2018 will be held on May 20, 2018. 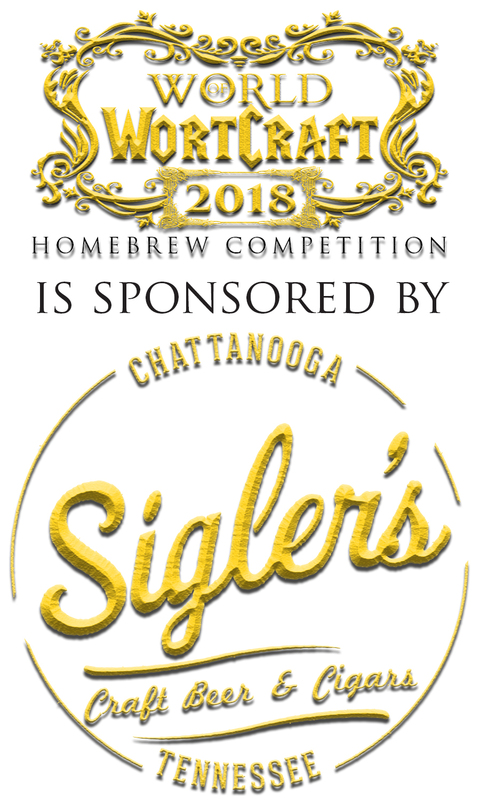 Sigler's Craft Beer & Cigars has graciously allowed us to use their facility for the judging event. If you would like to enter this competition you should know that it is a requirement to be a member of the Discord server. Membership is absolutely free and you can join using this link: https://discord.gg/bAa4bHt. To go to the competition page for details and rules click HERE. This is a national competition and open to any member of the group that lives in the United States. Since this site has affiliate links that can make money let me say that HopHeadHardware.com is not affiliated with White Labs. "We've collected strains from around the world for over 20 years and kept them locked away. Until now. Through The Vault for homebrewers, we're giving you the opportunity to open The Vault, release the yeast and get your hands on various specialty, creative, and unique strains. Most have rarely been used in commercial products, some have names you can barely pronounce, yet all are uniquely White Labs in quality and performance. HOW IT WORKS: Place a preorder on one of specialty strains listed below. When 150 orders are received, you’ll receive an email notifying you the strain will be released along with its estimated ship date. At that time, your credit card will be charged. Don’t wait. Place an order now and get your strain delivered right to your doorstep. 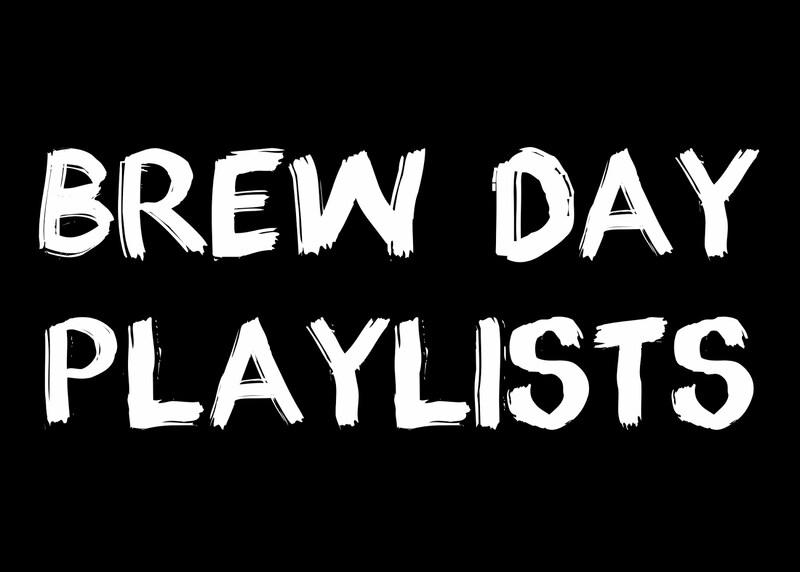 Keep checking back...We’ll continually add NEW strains into The Vault for homebrewers." The original release was so successful that White Labs put WLP066 back up for another round of pre-orders quickly after the first campaign reached its goal. My pre-order was placed during the first campaign. My vial of yeast arrived in a nice insulated mailer with an ice pack to keep the yeast cold. The ice pack was still cold when it arrived in Tennessee from California. Upon opening the package I immediately smelled old beer. Think of the smell of the dregs left in the bottom of a bottle conditioned homebrew if the bottle was forgotten for a few days (we have all done it). I had never mail-ordered a White Labs vial before since my local homebrew shop carries White Labs so I wasn't sure that this was a problem although I figured that it was. The next morning after I opened the package I sent a message to White Labs on Facebook Messager and within the hour they apologized for the inconvenience. They asked me for the email that I used to place the order and promptly sent a replacement at no charge whatsoever. White Labs did all that they could do to make this problem right. That is all that I can ask for. Things happen. White Labs provides an awesome product and they back it up with stellar customer service. I can't wait to let White Labs and all of the fine readers of HopHeadHardware.com know how WLP066 performs. I have a good feeling about this strain. It's no secret that big beer, primarily AB-InBev, is gobbling up craft breweries and controlling shelf space in doing so. The Brewers Association have been actively fighting for independent craft breweries in some very creative ways lately. I love the seal that they recently launched to help distinguish independent breweries products from cleverly disguised beer pretending to be independent. The BA took another swing at AB-InBev with their latest campaign, Take Craft Back. Click HERE to see the video at TakeCraftBack.com. It is essentially a crowdsourcing campaign to buy Ab-InBev with a goal of $213 billion (yeah....with a B). The staggering number along with the goofy, but good, video makes me believe that the BA has no real goal of buying the evil mega-conglomerate and that this is merely a creative marketing campaign to raise awareness of their Independent Craft Brewer movement. Although I don't think that the BA has any real goal of buying AB-InBev the campaign does make me wonder how we craft beer lovers could infiltrate the enemy and influence their tactics from within. It is possible. I'm not an expert of stock exchanges by any means but it seems to me that the BA would not even need a controlling interest in AB-InBev. Craft beer would only need to hold enough stock to create some noise. Let them push their swill; plenty of people like Bud Light Lime and that is ok. Let them keep Goose Island, Wicked Weed, Boulevard, and the others. Raise hell when they try to buy another craft brewery, but do so from behind enemy lines. Another option is to not care at all and just brew your own beer. 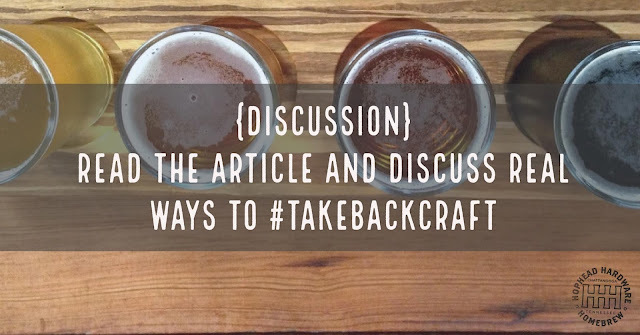 Join us on Facebook to discuss realistic options and ways to truly #TakeBackCraft. EDIT: The campaign is "Take Craft Back," we noticed our error after publishing. All of the information on this website is for educational purposes only. HopHead Hardware is part of multiple affiliation programs, including Amazon Affiliates, and links may help HopHead Hardware generate revenue. We appreciate you using our links if you decide to purchase anything mentioned on this website. Copyright ©2016 HopHead Hardware. Simple theme. Powered by Blogger.